India, in a meeting of 35 of the World Trade Organisation’s (WTO) 164 members on October 9-10 in Morocco, said meaningful reform in global agriculture trade norms can happen only if it begins with reduction of the “disproportionately large” subsidies of the developed countries. India was represented at the meeting by Commerce Minister Suresh Prabhu. The meeting was held to boost the preparations for firming up the agenda for the WTO Ministerial Conference (MC) slated to be held in Buenos Aires, Argentina, in December 2017 by providing a political impetus. The MC is the WTO’s highest decision-making body. Incidentally, India and China had in July jointly submitted a proposal to the WTO demanding the elimination of “trade-distorting” farm subsidies of developed countries as a prerequisite for consideration of other reforms in domestic support negotiations. The proposal countered the efforts by some countries to target the subsidies of the developing countries while letting the developed countries retain their huge farm subsidies, according to a statement by the Indian government on August 31. 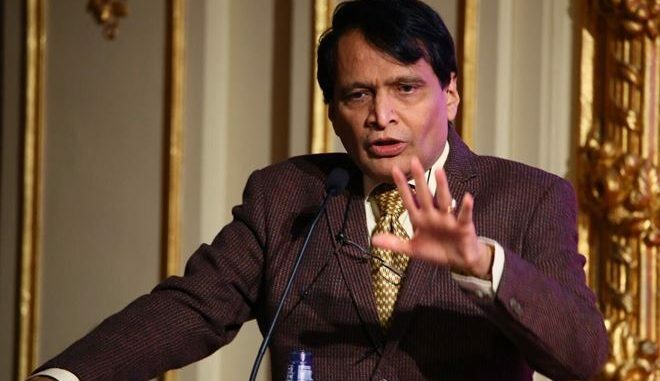 During the Morocco meeting, Mr. Prabhu led discussions on behalf of the developing world and reiterated commitment to the WTO’s Doha Round negotiations (that aims to boost the trade prospects of developing nations), an official statement said on Wednesday. achieved at the MC in Argentina, as this was an issue of tremendous importance not only to India but also to several other developing countries. Mr. Prabhu said such a permanent solution would give a strong signal of determination to end hunger and achieve food security, as mandated in the UN Sustainable Development Goals. Emphasising the importance of special and differential treatment for developing countries, the minister said India would be willing to engage on proposals that recognised this right for all developing countries without exception. The statement said Mr. Prabhu pointed out that in India, around 600 million people are dependent on agriculture, with nearly 98% of Indian farmers being on low income or resource poor and mostly engaged in subsistence farming. “Under such circumstances, it was imperative for India to balance trade liberalization with the need to protect the livelihood of its farmers,” it added. Mr. Prabhu also asked the WTO members to first deal with the issues which were already under negotiation in the WTO’s Doha Round, before moving on to new ones (such as e-commerce and investment facilitation). On the issue of elimination of certain forms of fisheries subsidies, he stressed on the importance of suitable special and differential treatment provisions and the need to make a clear distinction between large-scale commercial fishing and traditional fishing. The statement said Mr. Prabhu pointed out that India has a large number of small and resource poor fish workers depended on traditional fishing activity as a source of livelihood. “He [Mr. Prabhu] observed that developing countries like India, possessing very low fishing capacity, would also need to retain policy space to promote and create such capacity,” it added. Mr. Prabhu also spoke about the importance of a transparent and inclusive process of negotiations at the WTO and the need to do all preparatory work before the MC, so that only issues, which have matured for conclusion, are taken forward to the MC. On the sidelines of the meeting, Mr. Prabhu also held meetings with Ministers from the European Union, South Africa, Argentina, Brazil, Russia, Rwanda, Morocco, as well as the Director General of the WTO.